The never-ending proliferation of warranty scams continues. Some companies, after leaving a trail of unsatisfied customers behind them, think they can change the arrangement of their spots by making a slight name change. No matter what, the spots reassemble to spell S-C-A-M. Enter Services Protection Direct (see the letter I received earlier this year). Apparently, Services Protection Direct pissed off so many consumers with their so-called ‘warranty protection plans’ that instead of improving the plans themselves, they simply altered their name and launched a new website (not unlike Automotive Protection Services): meet the ‘new and improved’ Protection Direct, everyone! Curious though, the letter I received bears a Waterloo, Illinois address, yet Services Pro…erm…Protection Direct is located in St. Louis, Missouri. Services Protection Direct is now known as Protection Direct WE DO NOT UTILIZE ANY FORM OF OUTBOUND TELEMARKETING AS AN INITIAL MEANS OF MARKETING OUR PRODUCTS AND SERVICES. Okay, good for you, Protection Direct! Somehow, though, I don’t think you’ve completely abandoned “outbound telemarketing” tactics. 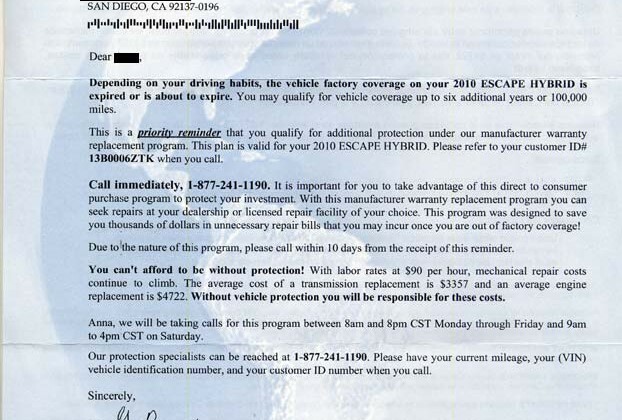 Evidence this from 2011: a letter similar to the one I received (same stationery, same fonts and formatting), abbreviating their name as ‘Program Headquarters (SPD)’, but with the St. Louis, Missouri address. So, do the Waterloo, IL and St. Louis, MO addresses belong to the same company? Apparently they must be one and the same, because the company’s name was changed in 2009! So why did I receive a letter from Services Protection Direct in 2013? No matter how legitimate their products may be (and that’s questionable at this point, given the company name kerfuffle), their marketing methods are certainly not. I’m thinking the Waterloo, IL address might actually belong to a marketing company representing itself as Services Protection Direct, with or without Protection Direct’s aegis. 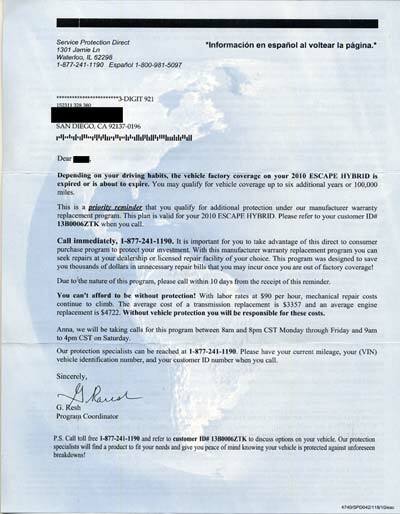 Protection Direct insists that they do not use outbound telemarketing tactics, then exactly who is behind these expiring warranty letters? With all of the confusion between names, caution would err on the side of simply ignoring these letters altogether. If you’re at all curious about the warranty plans offered by Protection Direct, it would behoove you to call them directly and GRILL THE HECK out of their customer service representatives. Once again, caveat emptor, people.